Heavy rain has accelerated the land slippage on a doomed development in Tala, which consists of four apartments, two villas and eight townhouses; the developer has provided alternative properties. A stricken Tala building development located just above a busy road in Paphos is sliding down a hillside faster than ever following this winter’s heavy rainfall. Residents and local officials are concerned that the buildings could come crashing down onto the road below – the main access road in and out of Kamares village – causing injury or even death. 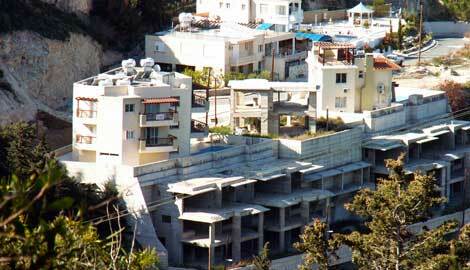 The Tala development, which consists of 14 units – four apartments, two villas and eight townhouses, (the latter still a concrete skeleton) – is the subject of a legal wrangle which saw the Paphos District Office (PDO), the responsible body, apply to court for a demolition order for the buildings in February 2016. The request failed because of legal procedures and technicalities, according to Mary Lambrou, the Paphos District Officer. The PDO has appealed this result, which is now before the Supreme Court. Tremetoushiotis Developers Ltd – operating under the umbrella of Top Cyprus Properties – were responsible for the construction of the development, but have said that they would never have gone ahead with construction if they had been aware that the land was ‘problematic’ to build on. All of the necessary permits and licenses were issued for the project prior to construction, although Lambrou said that some building permit stipulations were not followed, such as retaining walls were constructed too high, at four metres instead of two. All residents and owners were forced to leave after authorities deemed the properties unfit for habitation. “We are monitoring the situation closely. There is no direct risk to public safety at the moment, but there is a later risk. This is the opinion of our civil engineers and others,” Lambrou told the Sunday Mail. She said that in addition to the PDO civil engineer, a private civil engineer is carrying out an independent study of the development, which will be examined by an ‘ad hoc’ committee consisting of three civil engineers in the coming days. The committee will oversee any additional safety measures. “We expect a decision from the supreme court by the end of this month or the beginning of April,” Lambrou said. She explained initial meetings were held between the developers and the PDO where suggestions were made to demolish the top half of the property, leaving the bottom part which at the time had little damage. “The developers decided not to cooperate with us. However, they did make arrangements with the property buyers to compensate them and we have not received any complaints about that,” she said. As well as waiting for a decision from the court another avenue is open to the authorities said Lambrou. “There is a clause in the streets and buildings law if there is danger to the public, then we can proceed ourselves (to demolish) after a notice to the owners. In case there are expenses, we could then sue the developers to recover our costs,” she said. Local Tala councillor Cathi Delaney has written to Lambrou to raise concerns about the condition of the buildings and the effect on the road. “There are assurances from the District Office engineers and other officials that if the building is going to slip there will be drastic changes before any slippage occurs. If the building reaches this stage, the road in front will be closed and traffic diverted,” she said. Delaney added that the estimated demolition/site clearance costs are in the region of €250,000/€300,000. Kamares resident Rowena Moore has lived in the area for 25 years and drives past the crumbling Tala development daily. She said changes to the buildings and road in the past couple of weeks have been swift. On Thursday, Tala council decided to temporarily close the road for a couple of days while machinery removes large pieces of rubble that has been washed down the hillside in heavy rain. “The road will reopen next week and this work is not connected with the buildings that are built on the hillside,” community leader Areti Pieridou told the Sunday Mail on Friday. The case was judged in April 2018 and no blame was attached to Tremetoushiotis Developers. The case was referred to the Supreme Court to assess responsibility and reimbursements to any party. The Paphos Town Planning Department had a map issued by the Cyprus Geological Department showing that the land on which the development was built to be potentially problematic; the map was issued in 1993. Knowing this, Town Planning should have advised the developer that the company needed to undertake studies to check that the land was safe when developer applied for building permits in 2005. 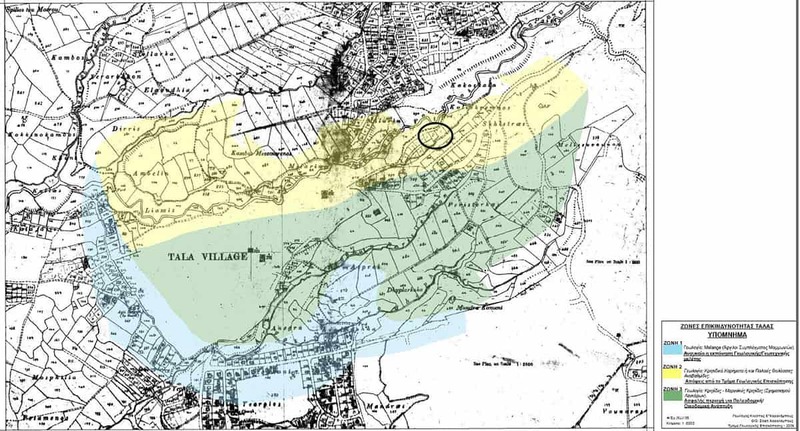 However, the Planning Department failed to advise Tremetoushiotis and, as a consequence, no studies on the land were undertaken. Tremetoushiotis Developers provided alternative properties of equal value at their expense. In February 2016, Tremetoushiotis Developers wrote to the local authorities allowing them to demolish and dangerous buildings to avert the danger of a collapse. Bravo Tremetoushiotis Developers. That restores consumer confidence in your company. Once again, bravo! Full marks to the developer concerned. Presumably the company could add ‘ple’ to its name in order to alert potential buyers?